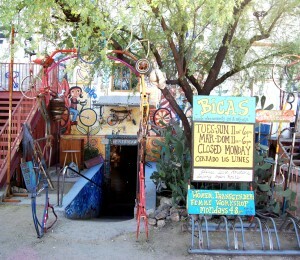 BICAS (Bicycle Inter-Community Art & Salvage) is a worker self-directed nonprofit 501(c)(3) bicycle center located just north of downtown Tucson. 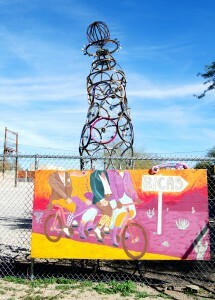 Relying largely on generous donations from our community, and responsible stewardship of those donations, BICAS is able to provide a variety of programs to learn how to fix a bicycle, earn a bicycle, create unique art from recycled materials, and provide programs specifically targeted towards youth. We believe in bicycles and other human-powered machines as essential vehicles for transportation justice, and we are always striving to make them more accessible to our community. We are an education center, not a traditional bike shop. New parts — the basics: tubes, tires, seats, racks, etc. 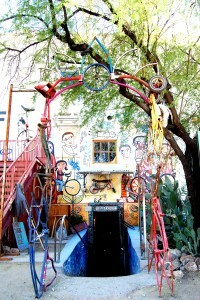 BICAS started in late 1989 as an organization called Bootstraps to Share. A group of like-minded community members came together to assist and empower the homeless population in Tucson, helping folks attain work, shelter, food, and transportation. Over the next few years, the organization focused on sustainable transportation as a requisite for sustainable work, determining their greatest impact was to provide recycled bicycles and the skills needed to maintain them. In that same period, youth became interested in the bicycle mechanics programs. Thus, BICAS in the way we know it today came into existence around 1994, although the name “BICAS” wasn’t used until 1996. We have since extended our bicycle recycling, advocacy and education programs out to the entire community. 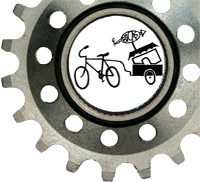 Since our founding, we have trained thousands of youth and adults in the trade of bicycle repair, maintenance and safety, and restored thousands of bicycles, saving them from the waste stream. We also have a more detailed history HERE.